Since 1901, there have been many unexplained deaths at Ginger High, a school for students with special powers. Daisy, a girl with mystical gifts, her friends and others from an alternate reality help solve the mystery. Ginger High is no ordinary school. It is a school for students with special “powers.” Many years ago people came to Earth from the Kingdom of Animist, a parallel universe. Two long time friends, Matthias and Amanta, attended the school and then returned home to Animist. The school has had many unexplained deaths. Daisy Fisher attends the school after her old school burns down. Matthias and Amanta are called back to the school to help solve the mysteries. What are powers? And what is with this crazy school? Welcome to Ginger High. Ginger High Melissa Burmester Reviewed by Neha N. Kashmiri (age 14) for Reader Views (3/09) Daisy Fisher is a normal teenager until the day her school is burned down by one of her own friends. Luckily, one of her parent’s friends is the principal of Ginger High. Ginger High is not like most high schools. For one thing, gym class consists of Daisy getting beaten up by another student. Not only that, but everyone keeps talking about “powers.” What powers? And what will they do to Daisy when they find out that she doesn't have any? Or does she? At the same time the book follows Matthias and Amanta as they reunite after years apart. But as soon as they meet they are called to heal the king’s daughter, murdered in her bed. Both of the friends then set after the killer who they believe is somewhere on Earth. The two end up at GingerHigh, where the murders continue. Can they catch the murderer before it’s too late? I’ve never read a book like “Ginger High” before. But I wish that some things in the book were explained better - like the concept of the tribes, which was very fascinating to me. “Ginger High” is an interesting and attention-grabbing book and if it has a sequel I am definitely picking it up. Melissa Burmester, who is 14 years old, is an accomplished writer. At age 14, author Melissa Burmester makes her writing debut with her first novel, ‘Ginger High.’ Part supernatural and part mystery, ‘Ginger High’ tells the story of two realities colliding that result in a spine-tingling adventure to solve a string of murders taking place at a supernatural school. ‘Ginger High’ spans the period of 1901 to 2007. Ginger High is a magical school in New York where students learn to utilize their supernatural powers. The story opens in 1901 where a series of murders takes place at the school with the victims found dead with a bite mark on their necks. The plot then advances to modern day where a young girl by the name of, Daisy Fisher, attends Ginger High after her school burns down. Daisy and her friends along, with supernatural beings Amanta, Matthias, and Taeru, who have traveled through a portal from the supernatural world of Animist, work together to find a murderer. Animist is an alternate world where supernatural beings with special powers reside. In the story, the portal to earth becomes closed due to a War taking place on Animist. The plot advances to include the supernatural powers of vampires and magical powers of those who can teleport, heal others, and create fire. As juvenile fiction, ‘Ginger High’ taps into the popular supernatural genre. The central plot is about uncovering a murderer, but engaging subplots and themes are interwoven to make the story a page-turning adventure. Much of the character development centers on Matthias, Daisy, and Amanta. Such development includes Daisy coming to terms with her supernatural powers as well as evolving to a strong and independent young girl. As a feisty and head-strong young girl, Daisy is a character young readers will identify with and root for. As well, readers will follow Amanta as he struggles to survive and comes to terms with a family secret he has kept from his brother. There was a bit more dialogue than description. Setting descriptions could have been a bit more detailed. There could have also been a little more ‘show’ and a little less ‘tell.’ As well, I would have like to have learned a bit more about the war taking place on Animist. At age 14, Melissa Burmester clearly has a gift for story telling. The hidden secrets that are unraveled make the story an enjoyable read. ‘Ginger High’ is highly recommended to readers who enjoy action packed adventure wrapped in exciting supernatural suspense. Tracy Roberts, Write Field Services. Ginger High BY: Melissa Burmester PUBLISHED BY: Infinity Publishing.com PUBLISHED IN: May 2009 ISBN: 0-7414-5363-0 Ages: teen & up Reviewed by Billy Burgess Growing up in the 90’s, I was a big fan of teen horror novels – Christopher Pike, R.L. Stine and Lois Duncan were some of my favorite authors. The teen horror/thriller trend has died down, except for the ones where vampires sparkle. I found Ginger High a breath of fresh air. Teen girls will easily connect with the main character, Daisy – a smart, strong young woman. The novel begins in 1901 where a series of murders take place. All of the victims have bite marks on their necks. Could it be vampires? The story jumps forward to modern days and focuses on teen Daisy Fisher. After her school is burnt down, Daisy is sent to a new school in New York.. Ginger High is a private school for students with extraordinary powers and abilities. She befriends some of the students who can teleport, heal others, and create fire. She soon finds out that people came to Earth from a parallel world called the Kingdom of Animists. 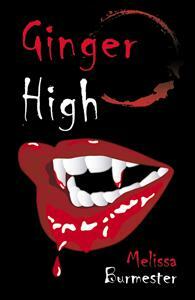 A murder occurs at Ginger High, bringing the supernatural beings Amanta, Matthias, and Taeru from the parallel world. While they investigate the death, Daisy struggles with her supernatural powers, and with her mysterious new friend, Fredrick. Amanta must deal with a long time, buried family secret. Fourteen year old, Melissa Burmester has written a fast paced debut novel; combining horror, mystery and fantasy. I love the cover of the book – it reminds me of the horror movie posters of the middle 80’s. I highly recommend this book to anyone who enjoys a good mystery. The author has a bright future in the world of writing.